The app uses P97 Networks Inc.’s PetroZone® mobile commerce platform. For information about the new Liberty PAY app, see below or . P97 was founded in 2011 and Headquartered in Houston, TX. Their mobile commerce solution, PetroZone®, went live with mobile payments in March 2014. Current customers other than Liberty Petroleum include Phillips 66, Sinclair Oil and Gulf Oil. Liberty Petroleum went live in January 2017 with sites rolling out throughout 2017 and 2018. What advantages in the marketplace will P97 deliver me? PetroZone enhances relationships with existing consumers and attracts new consumers to increase in-store sales and margins, minimize wait times, influence the purchase journey and increase consumer loyalty. Drive more business to your store by encouraging the 70% that never go into the c-store. PetroZone includes mobile pay-at-the-pump and in-store transactions, and a merchant portal that allows retailers to create digital offers and fuel discounts for mobile users. What POS Systems does P97 support? P97 currently supports Verifone (Base 44.22 and higher), Gilbarco (11.01.G and higher) and Fiscal TravStar1 systems. Others are being worked on and interfaces will be completed soon. How can I view the Liberty PAY app? 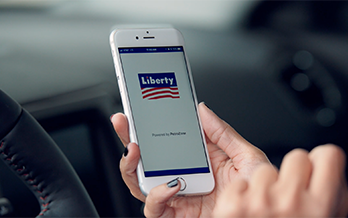 Liberty Petroleum’s mobile app, “Liberty PAY”, can be downloaded and viewed from the App Store or Google Play store. P97 is PCI certified (Level 1 ROC). No cardholder data or PII (personally identifiable information) is stored in the retailer or P97’s environments. Because mag-stripe cards are not swiped, zip code prompting and skimming are eliminated. How much does Liberty PAY cost? P97 can get you into mobile payments for ~ $1000 in year 1, and ~ $500 in years 2+. Digital offers and fuel discounts are an add-on service available at $99 per site per year (not to exceed $1000 for multiple sites owned by the same retailer). Fees are prepaid for the upcoming 12 months. Who can I contact for an agreement or questions? Please send an email to Sales@p97.com and include your name, phone number, email address, and specific questions, and your request will be answered within 48 hours. Liberty PAY helps build stronger customer relationships. "The pricing contract and supply you can count on are very important to us and Liberty delivers. When there are issues to be solved, the support we get is second to none." "The staff at Liberty has added value to our efforts that operators new to the brand have really appreciated."